On Wednesday me and my flatmate went to see Loose Women. It was so exciting as I've never been to see anything like it before and being a media student, I couldn't wait to go to ITV studios and see how everything is done. This is a very different post to what I would put on my blog, so if you're not interested, don't worry because there will be an outfit post up tomorrow. A month or so ago my flatmate and I signed up to SRO Audiences to try and get tickets to some shows, Loose Women being one we both really wanted to go to. A few days later we got an email saying we had priority tickets. We were both so amazed considering we only applied for them a few days before and we didn't think we would get tickets for anything. So on Wednesday we headed to London on an early train so we would be there in time for the live viewing of the show. At College I did a year of my media BTEC on panel and quiz shows so I was excited to see what I had learnt and tested out for myself on a real life television set. What made the day even better, when we were outside ITV studios trying to see where we needed to go, we saw Jonathan Ross! If you follow me on twitter or instagram you would have already known this, but it literally was amazing. 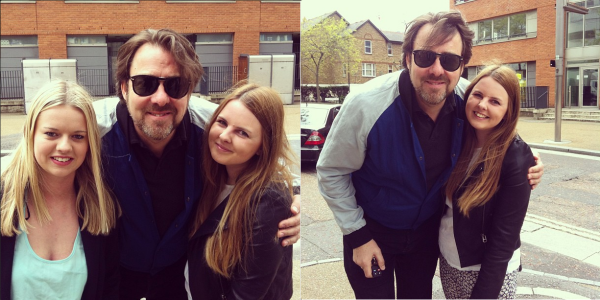 I'm a massive fan of Jonathan Ross, so it was so great to met him for a couple of minutes, and he was so nice! There wasn't many people around so he saw us lingering and asked us if we wanted a photo! Which was great because normally celebrities try to stay away from the fans and having their photos taken. Being completely starstruck it took us extra long to find where we needed to go. After a good 10 minutes of us going OMG we found the queue we needed to join. The wall which we was told to stand by was full of celebrity hand prints, my favourite being Paul O'Grady, who I adore. We spent the time in the queue uploading our Jonathan Ross pictures to every social media site possible and texting all our friends about what had happened ha. We finally got to go inside after almost an hours wait. We were lead into the building and went down a corridor filled with photographs of different ITV shows. The most surreal part was Queens guitarist Brian May (who was the guest on Loose Women that day) walked down the corridor and said hi to us all. Amazing! We went into the Loose Women set, which was crazy to see in real life! It definitely goes not look as glamorous as it does on television and is a lot smaller than you would expect. We were shown to our seats, my flatmate and I were placed on the third row right in the middle. Can you spot us in the top photo? There was an audience manager who told a few jokes to get us all going, and spoke about reacting, clapping and as well the 'ooooo' when ever the competition is mentioned. The 'loose women' were then introduced to us, who were Carol Vorderman, Lisa Maxwell, Carol McGiffin and Janet Street-Porter. Janet is my favourite so I was glad she was on the panel. Also, it's good to know, in the mugs they have on the desk, Janet has redbull is hers haha. It was so weird watching the show IRL rather than through the television. 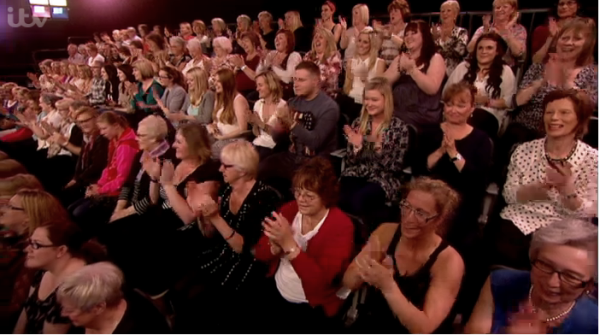 In the ad breaks the audience manager entertained us as well as interacting with the loose women on the panel. It was strange to hear Lisa say 'oh I should have said this when we were talking about that', it was just really weird, I had never really thought about what they talk about in the adverts. The guests on the show that day were Brian May from Queen and sports personality Gabby Logan, who were both really interesting. So the show was really great to watch. Overall, the experience was really cool, it was interesting to see the 'backstage' sort of stuff, what you don't see when you're watching it at home. It was actually exciting just being around the ITV studios and seeing what goes on. I would definitely go to see a show again! If you're gone to see a television show please let me know, I would love to hear about it in the comments, and what you thought of the whole experience. Tomorrow I will publish an outfit post which I wore to Loose Women, and also I did a little Primark trip so hopefully a haul will be up next week. Ah that's the worst ): Hopefully you'll get to see something else one day! That's soo cool, I remember watching Byker Grove. + seeing alan Carr I bet was amazing! Aww that's so cool :) I am so jealous haha!